Dr. Finson is a professor of science education at Bradley University in Peoria, IL, where he teaches elementary and secondary science education courses. 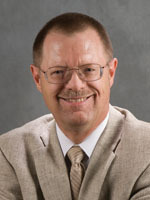 His teaching has included middle school and high school life, physical, and earth sciences, college-level earth science content courses, a foundations course in strategies and techniques, and graduate courses in instructional theory and program evaluation. He has served as a member of the board of directors for the international Association for Science Teacher Education (ASTE), and chaired its Professional Development Committee and Inclusive Science Education Forum. He has also contributed to the standards for the Early Adolescent Science Committee of the National Board of Professional Teaching Standards. Dr. Finson has also edited the international Journal of Elementary Science Education, served on editorial boards of several national science education journals, and has served on the publications committees of two national professional organizations. Dr. Finson has maintained a consistent record of publication in national refereed and practitioner journals. Dr. Finson has two primary areas of research interest. The first focuses on making science more accessible to students who have special learning needs. In particular, he explores how teachers can make adjustments and modifications to written materials, procedures, and simple equipment so students who have specific learning disabilities can successfully engage in doing science. The area focuses on students’ perceptions of scientists, which has included development of a framework to guide science educators in dealing with students’ conceptions of scientists.